With much of North America sizzling through a summer heat wave, now is a good time to stay in and stay cool with the new edition of ONE, just hitting your mailbox. All that and more can be found in our award-winning magazine. Visit this link for more. And check out the video below from our president, Msgr. John E. Kozar, describing what else you can find in its pages. On Sunday, the Holy See announced that Pope Francis, bishop of Rome, had created a new Eastern Catholic metropolitan church in the northeast African nation of Eritrea. The new Eritrean Catholic Church, carved from the four Eritrean eparchies (or dioceses) of the Ge’ez Catholic Church based in the Ethiopian capital city of Addis Ababa, will be sui iuris (meaning “of its own right”) and will be subject directly to the Holy See. According to the Vatican Information Service announcement, “the seat of the new metropolitan church is Asmara, [the capital of Eritrea,] which is elevated to the status of metropolitan archeparchy.” This new metropolitan church, which will continue to utilize the Ge’ez rites and traditions it shares with its sister church in neighboring Ethiopia, includes the eparchies of Barentu, Keren and Seghenity, in addition to the Archeparchy of Asmara. The pope appointed Bishop Menghesteab Tesfamariam, M.C.C.J., formerly eparchial bishop of Asmara, as the first metropolitan archbishop of Eritrea. The Holy See also announced that the re-formed Ethiopian Catholic Church, led by Cardinal-designate Metropolitan Berhaneyesus D. Souraphiel, C.M., will include a new jurisdiction, erecting the Eparchy of Bahir Dar-Dessie, and asking Bishop Lisane-Christos Matheos Semahun, the former auxiliary of Addis Ababa, to shepherd its 18,000 Catholics. Click here to learn more about the Eritrean and Ethiopian Catholic churches, and their ancient Ge’ez rites and traditions. To learn more about the Eastern churches, visit this new feature we have created that gathers together the profiles written on all the Eastern churches featured in ONE magazine between 2005 and 2012. The situation of Christians in post-Morsi Egypt has grown rapidly and significantly worse. Pro-Morsi forces accuse the Coptic Christians of having staged a military coup against the democratically elected president. Although the number of Egyptian Christians is so small (estimates range between 5 percent and 15 percent of the population) that it would, practically speaking, be impossible for them to overthrow the government, nonetheless all over the country violent attacks on Christians and Christian institutions have reached an unprecedented level. On 17 August 2013, a list was published of 32 Christian institutions that had been attacked, looted or destroyed since Mr. Morsi’s removal. When the looting and destruction of Christian homes and businesses are also taken into account, the list is only the proverbial tip of the iceberg. The image of Patriarch Tawadros standing with General el-Sisi has become a rallying point for the pro-Morsi, anti-military demonstrators to focus attacks on Christians as the enemy. Egypt is experiencing the worst of all possible situations; there is no clear good side and no clear bad side. The actions of the pro-Morsi supporters who attack Christians show quite clearly what their agenda may have been all along. Yet the military’s actions and the ferocity of its response to the pro-Morsi demonstrators make it very difficult to be sympathetic. In fact, that is a major problem: it is almost impossible to be completely sympathetic to either side. Each side has grievances and each side has committed atrocities. This has made it very difficult, if not impossible, for countries like the United States and the member states of the European Union to take a clear stand on what is happening and to support one group against the other. The situation in Egypt highlights a very important fact that is crucial for the entire Middle East. Despite all the rhetoric, democracy alone is not and cannot be the answer. Since the advent of the Arab Spring, there has been a great deal of talk about democracy. Most of it has been shallow and naïve. In the Autumn issue of ONE, Don Duncan writes about efforts to help in the hungry in parts of Ethiopia. Here, he offers his personal impressions of the region he visited. I was only about 5 when Irish rock singer Bob Geldof was making headlines again. We were used to seeing him prancing around a stage singing hits like “I Don’t Like Mondays” with his band, The Boomtown Rats. Ireland is a small place and we are almost systematically proud of anyone who makes it big beyond our shores. By 1984, Geldof was becoming known more for his humanitarian credibility than for his indie credibility. Responding to BBC reports of a burgeoning famine crisis in Ethiopia, he established a series of charity initiatives in the United Kingdom and beyond involving rock stars and rock concerts. Band Aid in 1984 and Live Aid in 1985 netted a combined total of $245 million for Ethiopia. Almost 30 years later, Geldof remains high in the Ethiopian consciousness. Everywhere I went, the mere mention of my nationality elicited the same response: Bob Geldof! In Europe, the legacy of the Band Aid/Live Aid era has been a deeply entrenched image of Ethiopia as a place of poverty, misery and famine. My experience so far in this county has been to the contrary, thankfully. Sure, the country has its problems but it is rapidly developing and most of the regions are stable, food secure and progressing. It was not until I got to the northern region of Tigray that a shadow was cast on this largely positive impression. Many areas near the border with Eritrea in northern Tigray, as well as in the desert areas of southeastern Ethiopia, are in constant danger of famine. Population growth over the past 30 years, combined with the detrimental effects of climate change on yearly rainfall, have rendered many swaths of the region barren and left its population chronically food insecure. It is here that I found the schools where CNEWA is helping to provide crucial high-energy biscuits during the months where food is most scarce. It was shocking to me to think that, while the rest of the country develops, some areas are slipping back to conditions similar to the traumatic famine that swept the country in the 1970’s and 80’s. But then I began to see terraces along the hills, dams on streams, small reservoirs, canalization and irrigation systems and other such technology dotting the landscape that spoke of a real effort to stave the effects of climate change. I was told that since the fall of the communist Derg regime in 1990 — a regime that worked on natural resource rehabilitation, but only in the villages it wanted to repopulate — the new administration has been very serious about land rehabilitation across the whole country. It reminded me of how famine can be political. Again, I thought of Bob Geldof and the politics of his Live Aid and Band Aid initiatives. Through music and televised events, he created a widespread consciousness of the Ethiopian famine among the populations in the West and, by extension, forced Western government to stand up, pay attention and take action. Most encouraging of all is that, unlike the external aid of the 1980’s, the land rehabilitation initiatives in Ethiopia today are managed domestically by the Ethiopian government. While much of the money for the projects comes from foreign governments and international agencies like the World Food Program, Ethiopia has taken the fore on managing its own risk with regards to drought, famine and food insecurity. This is very encouraging. Still, for many of the homes and schools I visited in northern Tigray, this sea change is imperceptible. Their fields are still poor and their stomachs empty for much of the year. But all around them, technologies and infrastructures are being put in place that will eventually, perhaps in the next few years, return a level of productivity to their land and food to their table. Read more of Don Duncan’s reporting in Hungry to Learn, in the Autumn issue of ONE. To find out how you can help feed the hungry in Ethiopia, follow this link. 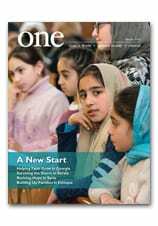 In the Autumn issue of ONE, Sarah Topol reports on young Copts persevering during a time of turmoil in Egypt. Here, she offers some reasons why they dare to hope. You read a lot of stories about Christians fleeing Egypt — they make up roughly 10 percent of the country’s 85.3 million people, and are now the largest Christian population in the Middle East. Since the revolution, Egypt’s economy has crumbled, the political system has in some ways become even more repressive and instances of sectarian violence have mounted. One might imagine every Christian would want to leave Egypt — or at least they would be depressed by their prospects in a country they have inhabited for centuries. And while feelings of concern, fear and anxiety continue — and there are young people who want to leave — the kids I spoke with in Cairo want to stay put. In reporting this story, I was struck by how positive the young people I spoke to were. It shouldn’t have shocked me, because you see this phenomenon throughout history; time and again, young people have asked for change because they are too youthful to have been disappointed in the past. They have less to lose than their parents. And let’s face it — your early 20’s are the time for idealism. But what made their optimism interesting to me is that these particular young people have been disappointed. In Feb 2011, president Hosni Mubarak stepped down, and many thought they toppled a dictator. They believed there was a New Egypt on the horizon. Instead, the transition has been turbulent. Ruled by an interim military government that prosecuted more civilians in military courts in 18 months in power than Mubarak did in his nearly 30-year reign, they then saw the election of Muslim Brotherhood President Muhammad Morsi. Under his term, journalists have been intimidated, the economy has continued to fail, rolling blackouts have hit the country and protests against his term have ended in more violent clashes with security services. From inflation to security to trash collection, everything in Egypt seems to be stagnating, if not getting worse. Yet the young people I spoke with were trying to stay positive, though even they admit that’s not easy. But why? We believe that after the dawn there is light. That’s the rule of the world; it’s not dark all the time, and it’s not light all the time, and we feel this is our time to make a change. We didn’t live under [Gamal] Nasser or [Anwar] Sadat. We didn’t live through all those wars. We didn’t live under the English occupation. This is our time to do something and this is our time to make history as young people. If we don’t do anything, then our kids are going to blame us in the future for standing still and watching our country fall apart. I think we get our enthusiasm from this. We try to encourage each other. If we ever give up, it’s over. It’s always important to have hope that something will change, but it’s about taking action — not just sitting in your home. Read more about Faith Under Fire in the Autumn issue of ONE. The major celebrations occur on Meskel Eve. Around 6 pm, huge crowds gather in the Square where many priests assemble to chant in the Geez liturgical language and dance the measured steps of liturgical dance. These days, parish youth groups also gather and sing and dance, and it is wonderful to see young boys and girls actively involved in this traditional celebration. Legend has it that on this day circa 330, St. Helena — who is known as Nigist Eleni in Ethiopia and was the mother of Rome’s first Christian emperor, Constantine — found the cross on which Jesus had been crucified. In accordance with a revelation she’d had in a dream, Helena burned a giant pile of wood and frankincense. The smoke rose into the sky and then arced back down to earth, showing her the spot where the cross had been buried. Fragments of the cross were distributed to churches around the world, and one found its way to Ethiopia, where it is now said to be buried under the Gishen Mariam Church in the northeastern Wollo region. Ethiopia, which has one of the most devout Orthodox communities in the world, is the only country that celebrates the finding of the cross on a national level.